Cucumbers are popular all around the world. They come in all kinds of shapes and sizes; infamous forever will be the EU guideline (abolished only a couple of years ago) determining the exact size and shape for cucumbers to be sold in the EU. There is an art and science about eating cucumbers in some countries comparable to the science of judging which melon is ripe on a market; a Bulgarian friend of mine once complained to me that so much of the world gets cucumbers wrong; instead of the huge, water-tasty ones eaten in most of the Western world, Bulgarians prefer cucumbers at smaller stages when their meet is still densely bathed in all sorts of flavors. But more about the Bulgarian style of eating cucumbers later in this blog. First, we need to get the basics right: do you already know the most straightforward way of cutting cucumbers? Maybe you do and you are a cucumber expert already. In this case, please ignore this contribution. And, please, don’t mind, but this needs to be explained. 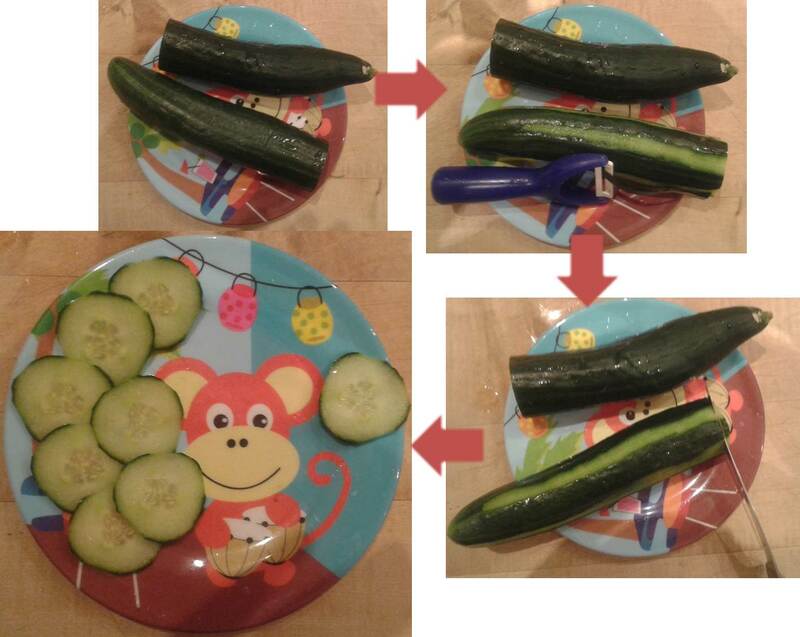 For all of you, who haven’t spend much thought how to cut a cucumber, let me explain the issue quickly. When you prepare cucumbers for a salad, it is pretty straightforward. Just cut it in thin, round slices, and it looks pretty. However, cucumbers have a peel. When you don’t peel it, the slices later taste very hard and dry. Peeling the cucumber, on the other side, is time intensive; you spend more time peeling the vegetable and make the outcome look regular, nice and even than actually cutting it. On top of it, peeled cucumber gets too soft too soon and loses taste. Already guessed the solution to this dilemma: just peel half of the cucumber and leave the other half of the peel on the cucumber. In other words: take off a stripe of peel and leave the next strip on the cucumber. Repeat this until the entire cucumber is patterned (peel – no peel – peel – no peel – etc). The beauty of this strategy is that almost always it looks pretty good; independent of how much you messed up peeling the cucumber. Previous PostFresh kraut salad – German style!